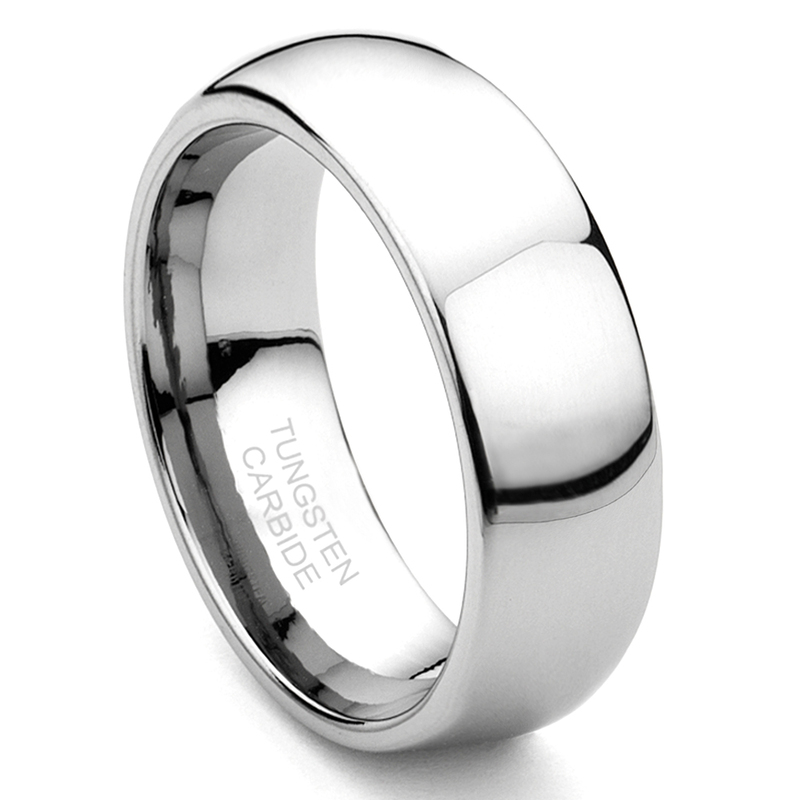 A classic domed tungsten wedding ring . This wedding is the best to represent your love as it will stay permanently polished. This is the widest plain dome wedding that we offer. It is so durable that if could be a replacement for your white gold or silver ring if you work with your hands a lot, or even for when you work out in the gym. It will not be scratched with daily wear. Comfort fit design of this ring makes it a perfect wedding ring for daily use. Click here for a brush finished version of this ring. I love how he loves it so much, I can't get enough it looks so good on him. He got a 8 width and 7.5 size ring. Thank you titanium Kay. I bought this ring as my fiancee's wedding band, and it is perfect! Fast shipping, true to size, and customer service that is truly dedicated to getting you exactly what you want. I had the band engraved with a design from my fiancee's favorite video game and they hand sketched the design when a jpeg image wouldn't work with their laser engraving machines. Can't recommend this company enough! I am not into flashy things and wanted a plain wedding ring but one made of something I couldn't tear up. Reviews on this ring and on Titanium Kay were great so I figured I'd give them a try. Reading reviews of others helped me to order the correct size (1/2 a size smaller than normal) but I was trying to decide between two rings so I ordered both. One was the Titanic Men's Tungsten Carbide and the other was the Brushed Dome 8MM Tungsten Carbide. I liked the look of the Titanic much better. It has a smooth finish and is highly polished but the gunmetal color sets it apart from other rings and I don't find it flashy. I love it so I returned the other one. Shipping was fast and the return process was very simple. I have confirmed the other reviews and found Titanium Kay a great company to do business with. I would highly recommend this ring as well as this company to anyone in the market for a great looking ring with a great warranty and at a great price from a great company. When we first purchased the ring it was bigger than we realized so I sent it back for an exchange. The whole process was so incredibly smooth, fast and easy. I would recommend this company to anyone looking for an amazing product with a company that happily stands behind their product. After searching a few jewelry stores my fiancé was disappointed that no one had the ring he wanted in the width he wanted and the finish. He has big hands and the 4 mm and 6mm looked small and weird. I happened to google what he wanted And came Across this ring. I read the description and I risked ordering it hoping he would like it. The return policy made it less stressful to order. Just in case the ring was not what he wanted. The ring arrived super quick and he loved it. Put it on and it was a perfect fit. Exactly what he wanted his ring to be. The price was great. I would definetly shop from you guys again. Incredibly fast shipping and the ring was even more beautiful in person! Almost couldn't believe how polished it is! Thanks for a great transaction!